This is a router based on components which acts as a provider to the various other components and has an api inspired by React Router 4. Why use this instead of vue-router? VueRouter is a fine project, which has tons of official support, and probably supports many more use-cases and edge cases than this. However, it does force you to define your entire route structure upfront. It also creates a slight disconnect between your routes and your UI, as if they were two separate things. 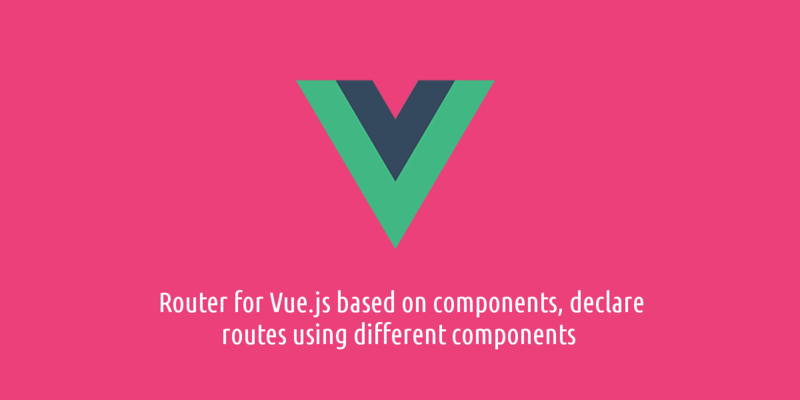 Using components as a router feels very natural in a component based, declarative system, which Vue is. Router acts as a provider to the various other components, or any other component which is decorated with withRouter, passing down the current location, and history object. It expects a location object, which has an API similar to window.location and a history object, with an API similar to window.history to be passed in as props. A component which passes the browser's history and location (via the history module on npm) to Router. This is what you will want to use (in a browser). Take's two props, path and exact. Path takes an express style route, and if the browser's location matches that path, it will show the content. The content can either be a a component, or a scopedSlot. They will be passed the router parameters, the path that matched (useful for nesting routes), and the current url (useful for building nested links), either as props, or as parameters, respectively. Passing in exact as true will make the route match exactly. Takes two props, to and and optional activeClass (defaults to 'active'). This will render a link tag which knows how to update the location, and will set an active class when the route matches the link. Expects a list of Routes as slots, and will render the first one that matches.